A "cabochon" is described as gemstone that is not faceted, but is cut into a convex and usually highly polished shape. The shape may be symmetrical, calibrated or freeform. Some people refer to these as "semi-precious stone" cabochons, but that is a misnomer as some of these materials are rarer and more valuable than diamonds and rubies! Some people collect designer cabochons, large cabochons, or loose gemstones. Metaphysical healers use small stones or cabochons in their rituals, but cabochons are most often used by jewelers and wirewrappers, to be set in beautiful and unique pieces of jewelry. Please be aware that cabochons are normally small in size-the measurements are in millimeters (there are about 25 mm to an inch)! Also all measurements are approximates and pictures shown are not actual sizes!! The word "cabochon" comes from the French word caboche meaning nail, and cabochons are named that because of their domed shape. A "cabochon" (pronounced kab-e-shawn and often shortened to cab) is usually flat bottomed and domed on top, although more and more cutters are doing fancy shapes and tops may be sculptued or even sometimes the top may actually be concave to bring light to a stone. In general, gemstones that are transparent (light passes through) are faceted, gemstones that are translucent (some light passes through) or opaque (no light passes through) are usually considered semi precious and are cut into cabochons. Also softer stones are usually cut into cabochons, as they scratch easier. Some gemstone materials must be cut a specific way, such as chatoyant Tigereye, or star Rubies to bring out their beauty. Fire Agate cabochons usually have a contoured surface to best bring out the rainbow fire without cutting through it. "Gemstone" is not a scientific word, but rather a collective name for all ornamental stones. The shape of a cabochon may be symmetrical-a mirrored image on both sides. Or they can be freeform-having no defined shape. Cabochons can be standard shapes-circles, ovals, triangles, rectangles or squares. Or they can be one of the more exotic shapes-bullets, tongues, arches, etc. Cabochons can be calibrated, a term used usually for rounds or ovals that have a standard size. Often times inexpensive or more common gemstone materials are mass-produced into symmetrical or standard shapes or sizes, for instance the well known 30 mm by 40 mm oval cabochon. Cabochons are usually measured in millimeters. These are great for beginner jewelers, as there are many pre-made standard settings for sale. Standard cabochons are also good for mass producers of jewelry as each piece of jewelry doesn't have to be custom made to fit the cabochon. Custom jewelers or wire wrappers demand more fancy or Designer Cabochons. Some cabochons are cut into really exotic shapes like clouds, leaves, hearts, etc. There are even fantasy cuts, or freeform sculpted cuts. Freeforms are usually done to accommodate a rare type of material, such as a druse material. If the rough stone material is expensive or rare the cutter will want to preserve as much of the material as possible. At BarlowsGems we specilize in rare and unique designer cabochons. We travel the world looking for striking patterns and bright colors. We personally orientate each cabochon to get the best possible pattern. Each cabochon is hand cut and polished. 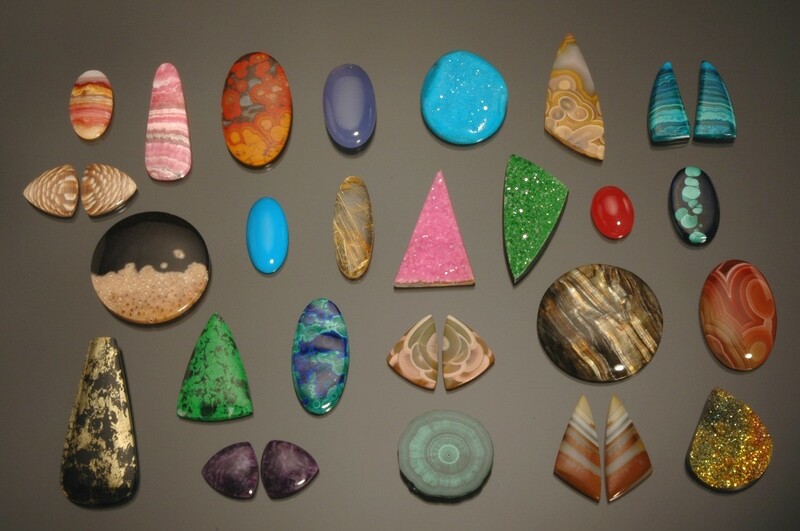 Please check out the cabochons we have by exploring our store. You can click on a material type to the left or you can search for specific shapes or colors by entering your choices in the search box. Make sure to search for the singular (triangle instead of triangles) for your most complete selection!